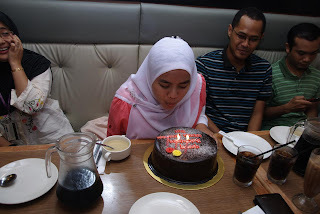 Bak kate Nomi, this is my 'entry wajib' everytime my birthday comes around hehe..
Usually, I'd list down all the well-wishers in my blog as a token of my appreciation.. cehh! Mcm la blog ni bagus sgt kan.. bes abis la tu klau name tersenarai haha.. But taking a leaf outta last years book, I decided against it. This is because, last year I seemed to miss out so many names and was constantly editing the said entry to add all other names I forgot. 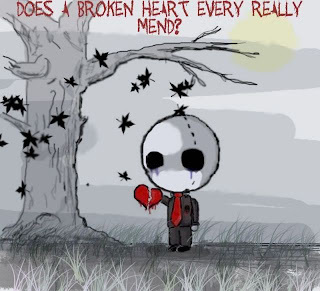 Malu okay, being reminded that you've forgotten someone haha.. So this year, I'll just talk about my birthday.. boley? It started with me being kidnapped by my neighbours the night before. Salleh kept asking me what time I finished my class and I just thought they wanted to go for some late supper. I became a bit suspicious when I realized their whole house was going out too.. alamak! Nak ngenekan ape plak ni diorg nih? 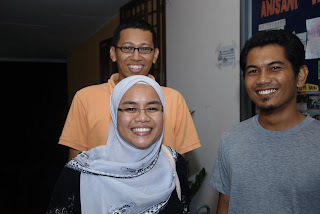 I rode with Rashid and was relieved when he said he wanted to pick up Ija, Anim and Jaja. 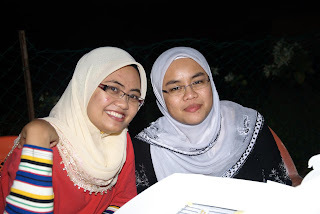 We arrived at Anisani and waited for Salleh, Dayah and Arif to arrive. 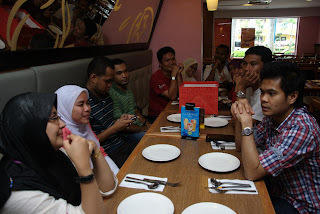 Sementara to, we looked through the menu for something to eat la kan.. lapo la jugak.. Chumel!! Suke! Then Sepul (who had a lighter in his pocket) was in charge of lighting the candles..
..and I was told to blow the candles.. with a wish la.. not less! :) Wanna know what I wished for? Heheh..
Then it was the 'cutting-the-cake-stage'. 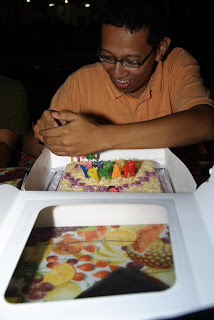 Sayang woo nak bukak those cute colourful candles..
After that, bermula lah sesi makan for us yg sedikit la lapo jugak..
Then that noon, Remy came for his promise to belanja us. 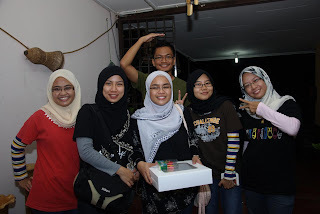 Little did I know, he also bought a cake with him.. yeayyy! 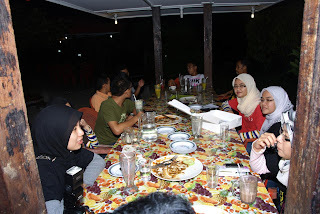 Then here's us when Salleh and the gang dah sampai..
..and another angle of our long table. 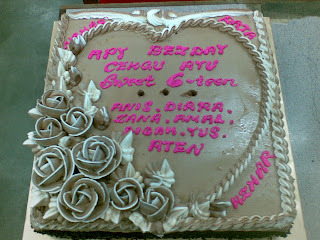 Abis la remy kene banjer ramai orang hehe..
Then I got to see what my cake was.. Yippee! 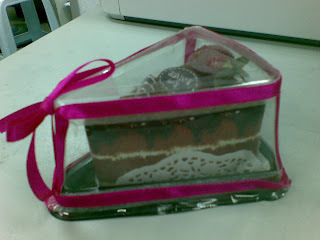 Choc Indulgence.. my fav!! And another 'tiup lilin' experience with the same wish heheh..
Semua org tersandar kekenyangan after an hour of feasting hehe.. thanx to Remy. 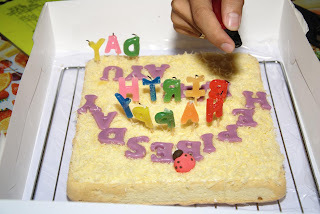 As we started to head back to school, abg Azahar called with another cake to give me :) But since we were all full, this cake was decided to be cut in school..
See, the birthday girl has to put her own candles on the cake hehe..
And here's the cake.. yummy! Seriously, sgt kenyang ok.. and I was thinking of not eating any cake for at least a month.. but.. But as I've raved in my blog haha.. it didn't end there! 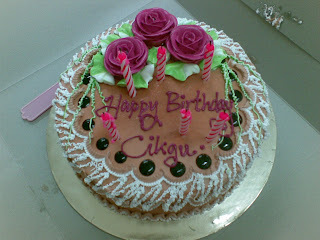 I got another two suprises from my students in Jawi..
..and my students in Pt Buntar! Gosh! 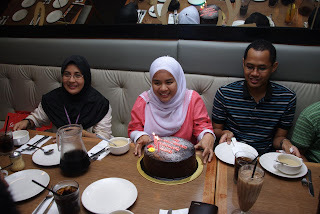 Who would've thought turning 30 would be so much fun kannnn heheh..
Birthday entry.. tuition version.. again?!?! As usual, for my birthday week I'd bring treats for my students and as said in the previous entry, this year I decided to make them myself but due to time constraits, I had to make the cupcakes batch by batch anytime I was free. As a result, I got different decorations for each batch. It wouldn't matter if it was a small class where I'd manage to give the same deco, but for large classes like both my form 5 classes, not all students got the same deco. 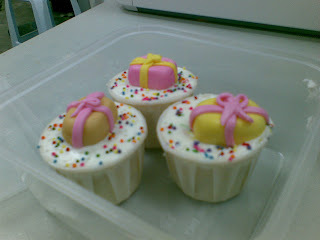 For this class, I decided to make my signature 'smiley' deco as I did for Helmi's birthday. 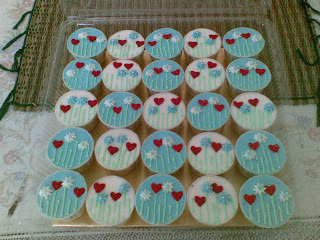 The other half of the class got the 'Dr Fauziah' type of deco, only this time I decided to try it with blue buttercream and the result.. Anyway, I really wanted to talk about the suprise my studetns gave me. Upon walking in the class, some boys promptly sang 'Happy Birthday' but I just smiled though I wondered how DID they know about my birthday. Throughout the class, the kids teased me about my age haha..
Then, in the middle of the class, I popped out for a while to fetch my cupcakes (which was supposed to be my suprise to them). When I returned to class, a whole group of students were missing. Feeling a bit annoyed, I waited for the for around 5 minutes before deciding I didn't wanna waste more time and proceeded to continue with the teaching. I was writing on the board when once again the class erupted into a birthday song for me. 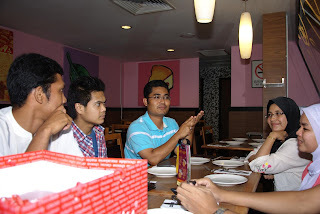 I pretended to cover my ears (they had told me they wanted to throw some eggs at the birthday girl.. aiyak! Of course la I tak ngaku I just had my birthday kannnn) but when they continued singing, I turned around to ask them to lower their voices (I was afraid we were disturbing the other classes) and was greeted by..
And thus, I got another cake for my birthday heheh..